We develop innovative technologies for improving and simplifying company-specific processes and place great value on close cooperation with our customers and partners from the milling machine production and system integrator areas. Together, we are able to continuously develop our future-oriented product portfolio and deliver optimum quality along with premium support. We wish to support you in recognizing complex tasks and enable you to solve them independently using hyperDENT®. Our well-structured training sessions have been designed to build upon each other and to systematically provide you with the required knowledge using case studies. Due to the many years’ experience of our highly qualified team, nearly all questions can be answered during the training sessions. Those who are interested in clarification of company-specific issues also have the possibility of requesting an individual training session. The training sessions are continuously developed by our team and confirmed with a participation certificate at the end of the course. We also offer online webinars for periodic training. The Update Webinars help you remain up-to-date on the latest developments, while the Top Topics Webinars go into detail about selected interesting hyperDENT® topics. The target group for these training sessions range from complete beginners to hyperDENT users with minor experience who want to gain a deep understanding of toolpath generation and automation options. The training content is built up from the previous sessions, but it’s also possible to book single days / modules. Basic knowledge for the application and options (hd_bas). For beginners with little or no hyperDENT experience. Get tips and tricks for getting the most out of your everyday hyperDENT use, including an overview of the latest version. “How do I create a template?”, “Which milling strategy is the best for my specific application? And why?”. On the second day, you will get the answers to these questions and more – including the possibility to work on your own individualized solutions. Need to know how to manufacture implant bars, screw-retained bridges, or individual abutments including the interface geometries milled from the blank? We will focus on how to use advanced implant functionality, geometry exchange, and template integration to create parts that are the same quality and consistency you’d expect from an implant manufacturer. The FOLLOW-ME! hyperDENT® Hybrid Module combines the capabilities of laser sintering and post milling specific areas of dental restorations into a single application. Using minimal material, very high quality dental indications with excellent surface finish can be produced effectively and in large volumes. Grinding with sub-optimal strategies can expedite the wear and tear of expensive tools and machine components. Learn how to optimize your grinding strategies to create better quality results, faster milling times, and a safer process that preserves the life of your milling equipment. Please note: It is not necessary to book 2 consecutive days. For example, you may wish to select a Tuesday and a Thursday training session. Please feel free to contact us for an individualized schedule, we’re happy to accommodate your request. Are you booking for one or more persons? We offer price reductions for companies that want to train multiple employees. Please ask for group training packages. All forms of training content are possible and will be defined based on your individual needs. Did you receive a specific customer requirement? Do you want to incorporate a proprietary technology to your hyperDENT workflow? The advanced FOLLOW-ME! training option is the right choice. You can book a training session at our office or we’ll visit your facility to address your company-specific demands. Inhouse training in your premises. Per your needs and requests. Our webinars are online training sessions which are held using the TeamViewer* web conference software. They are normally less than an hour long, so participation during the workday is possible. The FOLLOW-ME! Update Webinars provide compressed knowledge and answer questions about important new hyperDENT® innovations. The monthly Top Topics Webinars cover specific hyperDENT® topics or functions and use application examples to provide interesting tips & tricks to help simplify your daily work with our CAM software. 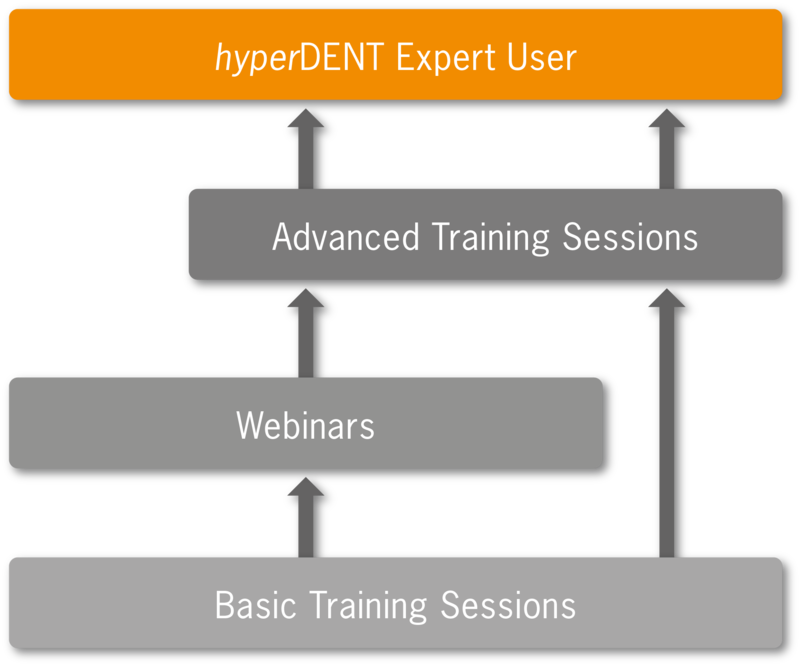 The Update Webinar online training sessions for hyperDENT® Version 9 will be announced in due course. The FOLLOW-ME! Update Webinars are free of charge for all customers under maintenance and interested parties. A hyperDENT® Top Topic will be presented every first Tuesday of the month. Our instructors’ close contact to customers and partners and years of experience enable them to identify interesting topics and enrich them using their technical expertise. Top Topic Webinar participants learn something new which can be put to practical use in the optimal implementation of their projects. The Top Topic Webinars cost 79€ per participant. What is required for participation in a webinar? Please note: Internal microphones on your computer should be muted during the webinar so as not to cause disturbing background noise. How do the webinars take place? FOLLOW-ME! will announce the dates and times for the specific webinars in a timely manner on our website and Facebook. Registration for all FOLLOW-ME! webinars is via the external service, Doodle* including the following user information: first name, last name, company, email address and if available, hyperDENT® license number (ticket ID). After successful registration, each participant will receive an email confirmation via Doodle including a link and login data for the participation in the specific webinar. Participants should login in 5 minutes before the webinar is scheduled to begin. The instructor will open the webinar as scheduled and will close the online training session at the end of the session.